Are you enjoying your summer staycation in your backyard pool? Summer started a little late this year, but July has brought great pool weather. While backyard pools are a lot of fun and create lifelong memories, it’s important to follow some basic environmentally-friendly actions. Before providing tips about pool maintenance, please see the next section about sanitary and storm sewers. Did you know there is a difference between sanitary sewers and storm sewers? A sanitary sewer is where all the water used inside your home or business ends up after it has been used. The water from toilets, sinks, showers, dishwashers and washing machines flows to a wastewater treatment plant (WWTP), where it is cleaned and tested before being released back into Burlington Bay or Lake Ontario, depending on the location of the WWTP. A storm sewer collects rain and melted snow through large grates on the street known as catch basins. This water flows directly into a local creek or water body without being treated. In Halton Region, this untreated water eventually flows into Lake Ontario or Burlington Bay. 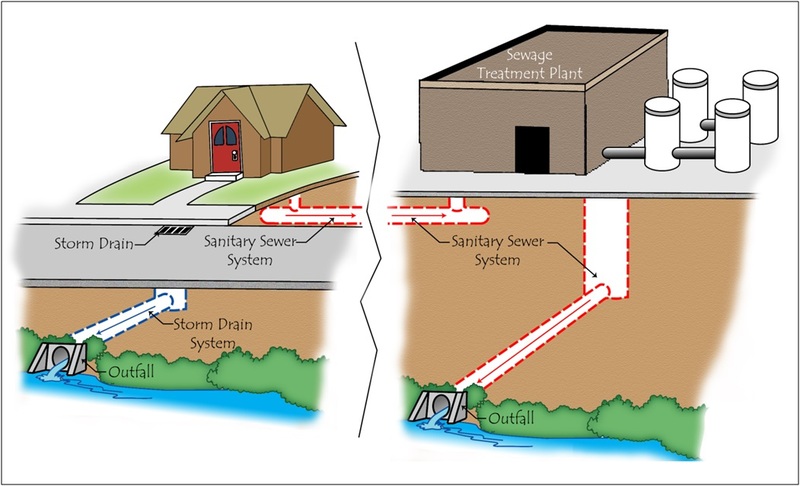 An image showing the difference between a sanitary sewer (water flowing through this system is treated at a wastewater treatment plant) and a storm sewer (water flowing through this system is not treated at a wastewater treatment plant). Image courtesy of Trout Unlimited Canada. Pool water contains several products, such as chlorine, which help to keep the pool clean. However, if released directly into the storm sewer (the water that’s not treated and ends up directly in water bodies), pool water can have a severe impact on the microorganisms, plants and fish in our ecosystem. Backwash water, which is created when rinsing the filter with clean water, contains sediment and chemicals. This water must be filtered and dechlorinated if it is going to be released in the storm sewer. Otherwise, it must be discharged into the sanitary sewer or across the lawn on your property. See below for additional details. 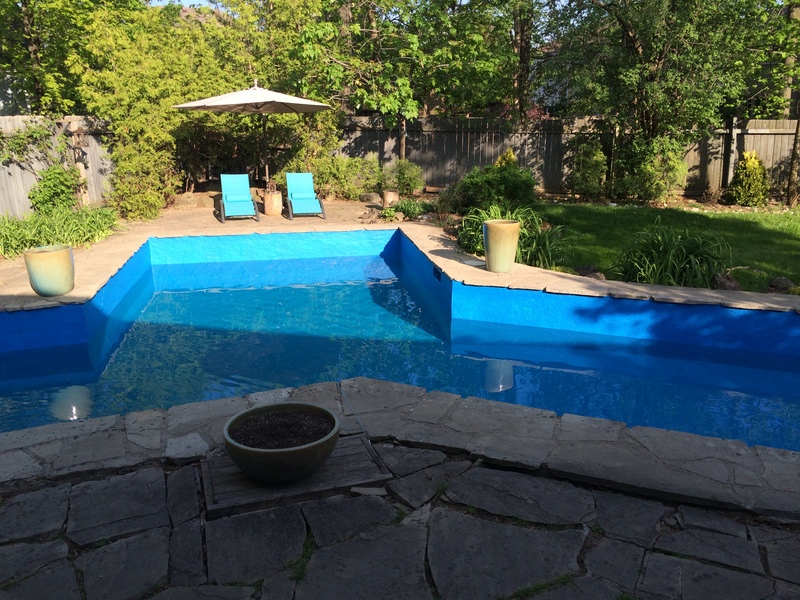 What should my pool service company or I do if I have a chlorine or bromine pool? Dechlorinate the water by letting the pool water sit for a week or more, preferably under sunny conditions. This will allow the chemicals to evaporate, lowering their concentration in the water. Test the pool water to ensure that levels are close to zero. At this point, you can slowly release the water on your lawn to be absorbed into the ground or to a storm sewer on a day when rain is not forecasted. When you release pool water onto your property, there is the added benefit of watering your grass. Pool water discharge is not permitted on private property, without the consent of the owner, or on sensitive lands such as a ravine, valley, wetland, watercourse, etc. What should my pool service company or I do if I have a saltwater pool? Unlike chlorine pools, letting a saltwater pool’s water sit will not alter the salt levels within the water. As a result, saltwater pools must be slowly emptied into the sanitary sewer connected to your home or removed by an approved waste hauler. Under no circumstance can a saltwater pool be discharged into a storm sewer, a sanitary manhole or directly into a ravine or creek. The saltwater itself can kill aquatic organisms. Saltwater pools should only be drained during dry weather and never during a storm. For homes with a sanitary lateral (commonly called a sewer pipe) cap, the homeowner can remove the cap with a wrench and slowly drain the saltwater pool through this pipe. Another option is to drain the pool through a laundry tub in the basement. The City of Burlington has created a pool maintenance brochure called Your Guide to Proper Pool, Spa and Hot Tub Maintenance available at www.burlington.ca/water. This new brochure will also be provided with pool permits. Check out an informative video produced by the City of London, Ontario called Drain Your Pool the Right Way that explains all the information highlighted above in a different format. Take Action Burlington. Empty your pool, spa or hot tub the right way. Collectively, we can make a difference. This post was originally published in August 2016. It was decided to post updated versions in 2017 and 2018 to help raise the level of awareness about this important topic.